(Xici Hutong Reporter Home) A Reporter Can Lose Independent Judgment At Press Conferences. By Xinhua reporter Wu Hao (伍皓). June 30, 2007. Before the regular business meeting, reporter Wang Jiang came into my office and told me that the Dianchi Administrative Office had held a press conference in the morning about the blue algae explosion. The blue algae explosion at Dianchi has been one of the hottest news stories in the past few days. The Dianchi Administrative Office kept quiet for several days, but they have now spoken. I thought that it was a good thing that they did. After the regular business meeting was over, I returned to my office. 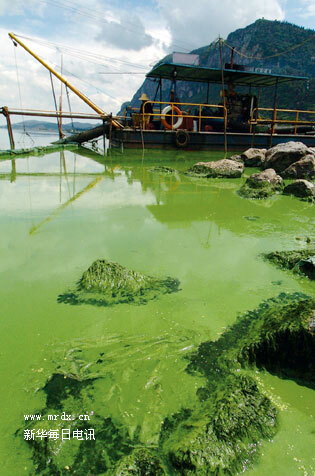 A news report from Li Huaiyan and Wang Jiang showed up on the computer: <Dianchi Administrative Office: the blue algae at Dianchi cannot simply be described as an "explosion">. I read though the report quickly and I became suspicious: the Dianchi Administrative Office denied that there was an explosion of blue algae at Dianchi. So everything the many media reporters witnessed and photographed was false? Besides, the reporters completely accepted the explanation of the Kunming city Dianchi Administrative Office and enumerated the reasons to explain why the previous reports about the "explosion of blue algae at Dianchi" were "inaccurate." Wang Changshan also saw this report and he came to see me to say that he thought this was improper. So I asked the writer of the report Li Huaiyan to come to my office: "Two days ago, you wrote the article about the explosion of blue algae at Dianchi. Now you are writing that there is no 'explosion.' Are you slapping yourself in the face?" Huaiyan said with some misgiving: "I did not slap myself in the face. It was the Dianchi Administrative Office that slapped themselves in the face." "In your heart, do you believe the Dianchi Administrative Office's position that 'there was no blue algae explosion at Dianchi'?" I asked him next. "Of course, I don't believe it. We went to observe Dianchi ourselves and we took photographs." Huaiyan said in frustration. "But they called the press conference and this was what they said. News has to be true. Other than reporting what they say, what else can I write?" "Thirty to forty news outlets were there today. If we don't report it, there will be blanket coverage elsewhere about it anyway. We cannot go missing in action." He added. That is a problem. It is impossible not to report on it. But how shall we report it? I thought to myself: Right now, press conferences have become one of the major channels through which reporters obtain information. The reporter rely on and believe in these press conferences because it is simple and easy to just report what was announced at the press conferences. Someone said it and I just report it as is. I will have accomplished my professional duty to "report things as they were." There is no thought about verifying the truthfulness of the information that was announced at the press conferences. I remember something that happened some time ago: We reported on the compulsory notarization fee on the sale of second-hand housing units in Kunming city and it drew a huge public reaction. The Kunming city Housing Administrative Bureau called a press conference for a dozen local media outlets behind our backs and claimed that "the Xinhua report was inaccurate" and "the total amount of notarization fees was not the 30 million yuan as asserted by Xinhua since there was only 27 million yuan year-to-date on November 2006." The Kunming metro newspapers <New Life News> actually printed "Xinhua report was inaccurate." So I "invited" the <New Life News> reporters to my office to discuss. These were two young girls, including a university student who was an intern. I asked them: "Do you know how to do simple arithmetic? How can you be fooled by the Housing Administrative Bureau? The sum was more than 27 million yuan up through November. Isn't there another month left? If you add that up, isn't the total for the year going to be 30 million yuan? How can you let the Housing Administrative Office say that we were inaccurate and report the assertion as is? And why didn't you call us and ask?" The two young girls said innocently: "We never thought that there would be a problem with the information that the Housing Administrative Office delivered at their press conference." "A reporter cannot be led by a press conference, especially with respect to losing one's independent judgment and position." I reflected to Huaiyan. "Right now, the press conferences of some of the government units resemble more and more like collective buyouts of reporters. They led the reporters unconsciously and collectively to become their mouthpieces and spokespersons. Be alert!" Huaiyan seemed to have been touched. He asked: "So how shall this report be written?" My thoughts were ready: "First, you can make a purely objective report. Whatever the Dianchi Administrative Office said, you make the purely objective statement that 'The Dianchi Administrative Office claimed ...' Second, you should discard the formula that the contents of the report about a press conference should be limited solely to what was said at the press conference. We will report what the Dianchi Administrative Office said, but we will also interview some experts and citizens. We will report the opinions of all sides objectively!" Huaiyan left to work on the report. After a while, he charged into my office and said: "I got the interview! I interviewed an environmental protection expert and he said that it was meaningless to play word games about whether the Dianchi blue algae was 'an explosion' or 'a rich concentration.' The key is still effective administration and management of the growth of blue algae." "That's a good idea. Write it in!" I approved immediately. I got up and vacated my chair so that Huaiyan can edit the report on my computer. "I have never written such a report about a press conference. I am writing about the announced contents, but I am also writing about the opinions and views of experts and citizens." Huaiyan was talking to himself while he was tapping on the keyboard. Michael Gordon, the administration's best friend at the Times. Glenn Greenwald, Salon.com, February 12, 2007. Michael Gordon trains his stenographer weapons on Iran. Glenn Greenwald, Salon.com, July 2, 2007. The ongoing journalistic scandal at the New York Times Glenn Greenwald, Salon.com, July 9, 2007.